The Sepor Precision Riffle Splitter (Jones Type) is also known as a riffler or riffle splitter. It is precisely designed to reduce the bulk of material to a convenient representative size for laboratory analysis. When used properly, it provides an accuracy that is recognized throughout the industry. A hopper, with a manual control gate, receives the material to be split, then upon opening the gate, the material flows through a series of equally divided compartments of chutes, sending 50% of the sample to the left side pan and 50% of the sample to the right side pan. The manually actuated flow gate assures a proper distribution of feed material to the riffle bank, and eliminates the requirement for a third sample pan. The Sepor Precision Riffle Splitter is simple and easy to use. It is very easy to clean up, with all parts open and easily accessible. The dimensions used to size each Sepor Precision Riffle Splitter are, first, the chute width, second, the number of chutes, and third, the length and width of the hopper. The Sepor Precision Riffle Splitter consists of a stainless steel hopper with a manually actuated flow gate, stainless steel and anodized aluminum riffle bank, and stainless steel frame with support legs. 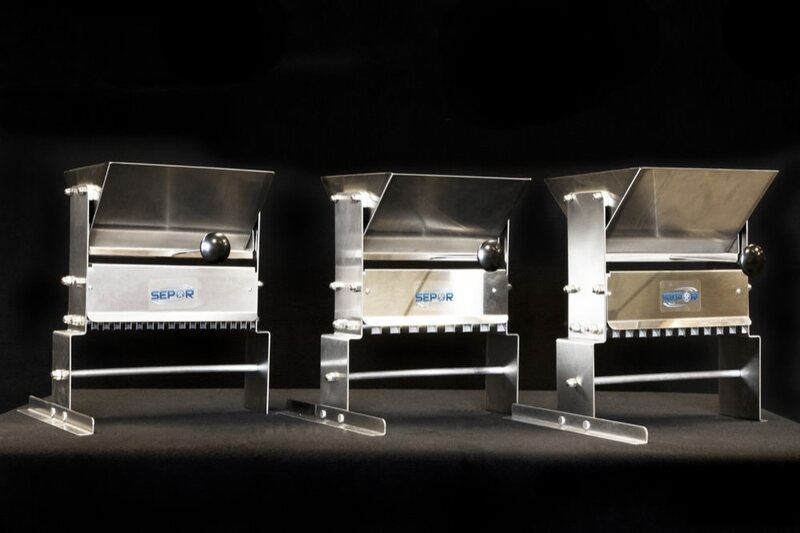 Two stainless steel sample pans are supplied with each Sepor Precision Riffle Splitter. All stainless steel used in the Sepor Precision Riffle Splitter is 16 gauge. The anodized aluminum used in the riffle banks is a hard aluminum alloy. The hopper may be left in the open position for easy cleaning.